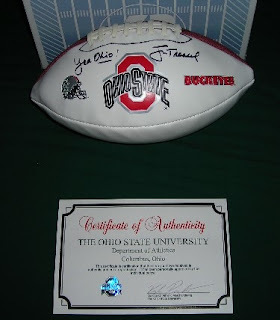 “One of our folks was able to secure a Jim Tressel-autographed football which he designated to be used to be a fund raiser for non-profits….so we are doing a little auction…to raise a little money…and for one of you to have a great present! All proceeds from the auction of this football go to thequest! “Details: The football has a Certificate of Authenticity. Bids are open today and close at noon on Dec 21st. Opening bid- $75 Suggested value: at least $100. Columbus metro-area will have free delivery. For those outside of the metro area, shipping and handling charges will apply. “When you bid, you will be added to the list of those who will receive an update when someone bids on the football. Each time the bid raises, everyone on the list will receive an email about the current bid…up until noon on 12/21 when the highest bidder gets the football–and donates to thequest!